I saw a question, which can be answered better with a demo. So I opened a new jsFiddle window (see at the bottom why). A white box opens up, and stays as it is for a long time (see below). I got frustrated and thought at least I could fix the minor formatting in the mean time while the snippet window loaded completely. Hence I duplicated the tab (using the duplicate option of Google Chrome) - a new tab opened where my post was in edit mode, without the snippet window opened. 5 minutes didn't pass, so I fixed the formatting issue and clicked OK - it became a new answer..! Wow... that is scary. I quickly deleted it, closed the duplicated tab, and ran away from there. Pasted the code from jsFiddle to stack snippet, clicked insert and post. This is the order in which things happened to the best of my knowledge (I somewhat panicked while all this happened, seeing myself posting multiple answers). I added content in the post-your-answer area and clicked the post-your-answer-button only once - the very first time. The rest were edits. I went to jsFiddle to make a demo because it has a nice list of libraries, and I can choose the libraries I want to include very quickly (jQuery UI in this case). When it comes to stack snippet, we're on our own, despite all the feature requests, sadly. 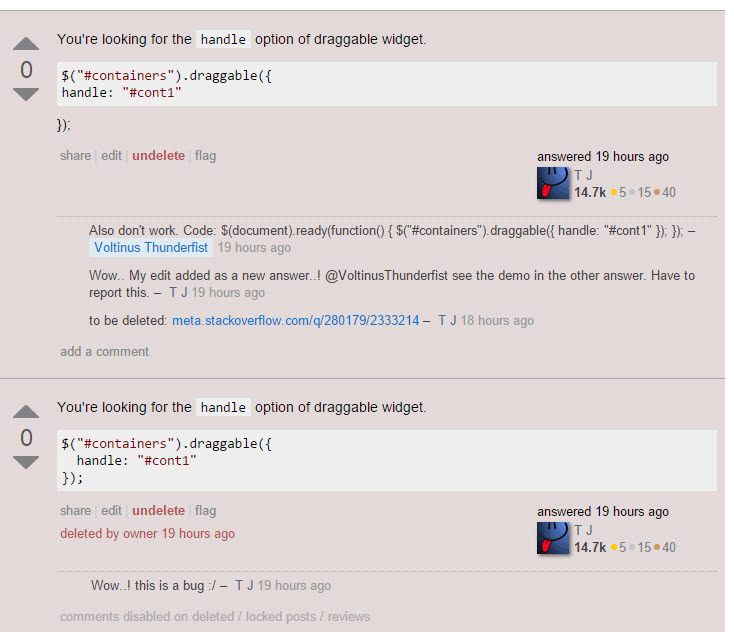 Browse other questions tagged bug stack-snippets multiple-answers .